The post appears at the top of your blog’s home page. The blogging software adds the post to your blog’s archive, usually by both date and subject, and to your RSS feed, which gets updated in newsreaders. Anyone who signed up for e-mail notifications receives an e-mail about your post. If your blog software pings blog search engines and services, those search engines and services receive a notice from your blog software that you’ve updated your blog and put that information into their catalogs. (A ping is simply an electronic notification.) Users of search engine websites can then get your blog post as a result of a search. A search-engine crawler indexes the post the next time it visits your blog. All these changes happen regardless of whether you think about them. The fact that blog posts are quickly distributed with a minimum of effort on the part of the blogger is part of the beauty and effectiveness of this format. Blog software and services are designed to deliver your content quickly. Of course, you can edit your blog posts after you post them, and many bloggers make changes when necessary. However, editing after you post is a pretty ineffective way to control your message, because visitors might read or e-mail the original post before you make your edits. Other bloggers might quote your post and expand on it on their blogs, creating partial copies of your deathless prose. Blog services might point to, and even partially excerpt, your blog post. Search engines might cache or otherwise archive the content temporarily or permanently. An Internet archive, such as the Wayback Machine, might add your blog post to its permanent database. 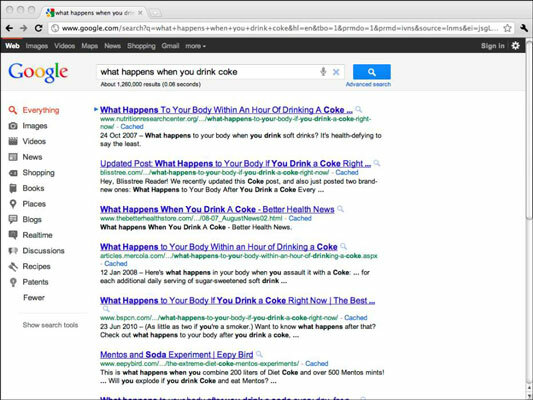 You can see these effects here; a Google search for the phrase what happens when you drink coke turned up not only a blog post but also several references to that same post on other blogs and websites, and on the news-sharing site Digg. Google linked to the original blog post and a cached version archived by Google. Publishing to your blog is a good thing! You want each of these processes to happen because they bring readers to your blog and present your content to potential readers. But be sure about what you’re posting before you start the ball rolling.